These types of plants were a craze back in the sixties, but we do not hear much about them anymore. There are more pollutants than ever in our environment, so one would think that air-cleaning plants would be back in action. Let's resurrect this practice and add plants to our our home and to our place of work to purify the air. NASA in association with the Associated Landscape Contractors of America conducted a study to evaluate the effectiveness of using plants to clean indoor air. The study determined that, besides the well-known benefit of plants absorbing carbon monoxide and releasing oxygen, they can also remove amounts of certain organic pollutants such as formaldehyde, trichloroethylene, benzene, xylene, toluene, and ammonia. These pollutants are found in building materials, paint, varnishes, adhesives, oils, and others. So, what can you do? There is a list of about 19 plants, most of which can be found at SmartyPlants, that the study determined to be air-cleaning plants, including ferns, Pihlodendron Pothos, Spider Plants, Chamaedorea/Bamboo Palm, Roebelenii Palm, Areca Palm, Ivy, Sansevieria, Rubber Plant, Dieffenbachia, Dracaena (Corn Plant, Marginata, Janet Craig), Lady Palm, to name a few. The study recommends a 10-12-inch potted plant for every 100 sq. ft. of area. Periodically dust indoor plant leaves to ensure proper absorption of air pollutants. Fertilize the plants organically and use rain or distilled water when possible for best results. Who wouldn't want to attract birds to his/her garden? Birds are not only pretty and offer beautiful songs, they also eat bugs! It happens to be their favorite meal. The Orange Geiger, a native Florida tree, is susceptible to beetles and other bugs. Last spring, our trees were full of critters. All of a sudden, we started noticing small birds cleaning the trunks and leaves of the tree with their beaks, which was awesome to watch. Once the trees had no more insects, the birds departed in search of another food source. What is the lesson? Invite birds to dine in your yard! There is so much that we can do to create bird sanctuaries in our urban spaces. If you want to learn about how to do that, we are now offering a fabulous new book by James A. Kushlan & Kirsten Hines - Attracting Birds To South Florida Gardens . We will invite the authors to make a presentation at SmartyPlants later this summer, but in the meantime, check out the new book and get started in making your yard every bird's favorite restaurant. A West Palm Beach company has developed a cool new product with a catchy name "DO IT YOUR-SHELF". You can create an 18-inch, or a 2-or-3-foot shelf in minutes without using screws or nails. It fits most fences, stairways, and balcony balusters. Hang plants that purify air and/or use it as a decorative shelf. 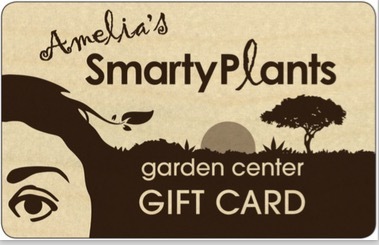 You can only get it at SmartyPlants!